Charlie Garcia works on a “popcorn box” at Alpha School in Las Cruces. As part of the exercise, the 4-year-old practices writing the word popcorn. Charlie Garcia is a bubbly 4-year-old with soft brown curls. Sitting down for a small group activity on a late-August afternoon at Alpha School in Las Cruces, she chatters with her teachers and friends. Evelynn, with straight brown bangs and a long bob, draws a perfect square with glue, then presses her sticks onto the paper. “Awesome everyone, great job!” encourages Polanco. Besides their hair and personalities, there is one other thing that sets Charlie and Evelyn apart from each other. Charlie has been to preschool before. Evelynn has not. 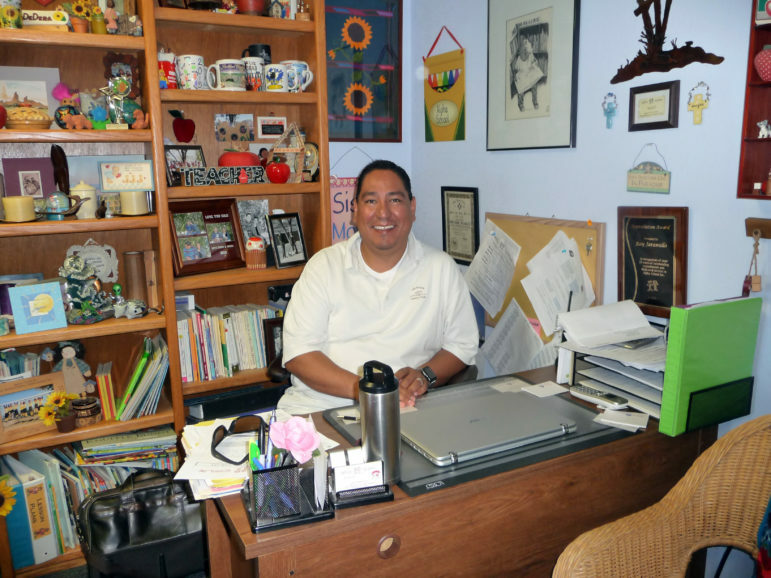 Charlie is an exception in the afternoon class of the state-funded New Mexico PreK at Alpha School, which is dedicated almost exclusively to children who haven’t had preschool, says Alpha School Director Ray Jaramillo. The school wanted to give more kids access to the purposeful play and learning that could affect the rest of their school careers. “What we’re trying to do is solve the problem in Doña Ana County, but I do believe that by doing this work, we’re going to affect how New Mexico looks at the situation,” says Frank Lopez, executive director of Ngage New Mexico. The education nonprofit organized a coalition of early childhood educators, child well-being nonprofits and community members that has the ambitious goal to guarantee universal access to early childhood education in the county. In many ways, Doña Ana County is a good laboratory to experiment with efforts to increase access to early childhood education: Its demographics are similar to much of the state, though it has a higher poverty rate and the complication of mixed immigration status for some families. Half of its population is in Las Cruces, the second largest city in New Mexico, but the other half resides in rural communities that struggle to offer high-quality childhood programs. And, it has access to a research university. Their analysis found that nearly two-thirds of children under 5 in Doña Ana County were not enrolled in free or subsidized evidence-based early childhood programs. But nearly half of the county’s children under 5 live in poverty, putting them at a disadvantage when they show up to Kindergarten. Families who can comfortably afford private, licensed childcare. The other big challenge is the the cost of high-quality childcare in Doña Ana County, where two-thirds of children under 6 have both parents in the workforce. The state helps many of those parents, spending $100 million per year on childcare subsidies for families making 150 percent of the federal poverty level. If you look at a map of childcare providers, you’ll see most of the high-quality centers in Doña Ana County are in Las Cruces, with a few in the south valley communities of Anthony, Chaparral and Sunland Park. There are just fewer options for high-quality care in the southern part of the county, where many of the state’s unregulated colonias sprang up. Colonias are defined as border communities that lack basic infrastructure such as roads, sewage and water. That leaves parents in a colonia like Berino with the choice of either driving their children at least six miles to Anthony or more than 20 miles into Las Cruces to access a high-quality center. “I think two or three miles is kind of a deal breaker for families with limited transportation. Definitely in the south valley,” said Michael Radke, program coordinator at Ngage who works on early childhood at the agency. Among the solutions the partnership is recommending is giving incentives to licensed providers to increase education levels and pay for their staffs, expanding the number of subsidies and making families eligible up to 200 percent of the federal poverty level, and eliminating co-payments to lessen financial losses to providers, making it easier for them to pay workers more competitive salaries. On a late August morning, the 4-year-olds at Alpha School are enjoying the school’s playground, where mature trees shade them from the New Mexico sun. In the well-provisioned play area children have access to climbing structures and swings, a sandbox and multiple buckets of toys. A pathway meanders through the yard, where kids pedal bright red bikes and ride scooters. It’s almost time to go in for lunch, and the teachers begin to round up kids. “Everyone pick up five toys please,” says morning PreK teacher Jennie Martinez. While the kids are animated, they follow their teachers’ directions, wait until called upon and let other students speak. Martinez says that contrasts with students in the afternoon preK. Most children in the morning class are regulars at Alpha School, and many have been in New Mexico’s Early PreK program. It’s only week two for the newbies in the afternoon preK class that Charlie and Evelynn attend. Polanco greets each child in the afternoon class by name as they walk in. A boy in glasses named Remy says he’s going to tell her three jokes and sing her a song. She listens with a smile as the budding comedian tells her his jokes and sings. The first-timers in Alpha School’s afternoon students are more rambunctious during reading time. The teachers remind many of the kids to “put their bottom on the floor,” to raise their hand when they want to talk, and not to interrupt their friends when they are speaking. “But they’ll get there,” says lead teacher Jessica Brooks-Pakinkis. It won’t take much longer than a few more weeks and you won’t see much difference between the morning PreK and the afternoon, she says. Before the state switched to the PARCC exam, participation in New Mexico PreK brought low-income students up to proficient level in reading. Since the switch to PARCC, which is considered a more rigorous test, just 26 percent of third-graders with prekindergarten are considered proficient in reading, but they still outperform students without PreK. Optimism is even greater for PreK combined with K-3 Plus, another state program that adds 25 days to the school year for students in Kindergarten through third grade. It is aimed at schools with a high percentage of students receiving free and reduced lunch, as well as at schools ranked as failing. 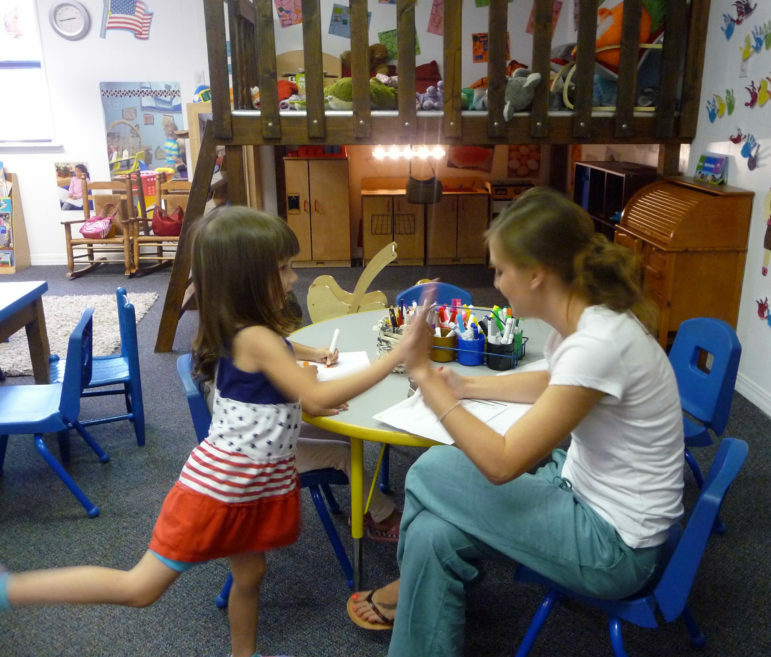 Evelynn Aguirre McClure gives her teacher Brittany Polanco a high five after working with her. This is Evelynn’s first experience in preschool. She attends the New Mexico PreK program at Alpha School. Charlie and Evelynn are in preschool for more than childcare. Their parents wanted to give them the advantages of preschool. 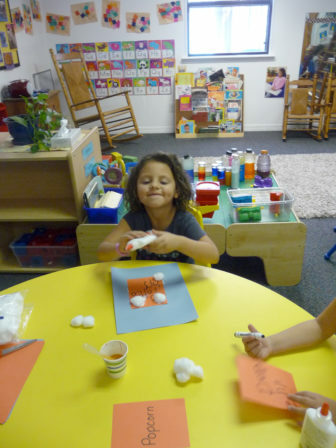 When Nayomi Valdez, Charlie’s mom, moved back to Las Cruces from the Albuquerque area, she was able to put her daughter in a Montessori school in Las Cruces while Charlie was on the waiting list for NM PreK at Alpha School, thanks to childcare assistance. The subsidy provided financial breathing room after a recent divorce. Meanwhile, Cassie McClure and husband Jorge Aguirre were able to leave their two children, Evelynn and Oliver, with McClure’s mother while they worked. It was a luxury that many others don’t have because they don’t live near family or don’t have parents able to help with childcare. Still, it meant that the shy Evelynn’s most consistent social interactions were with her grandmother and year-old brother. McClure was looking for a social outlet for her daughter. Jockeying for what little new money is expected for the coming fiscal year has already started. Children, Youth and Families Secretary Monique Jacobson is seeking $26 million more for her department, mostly to cover the growing cost of subsidized child care in New Mexico.